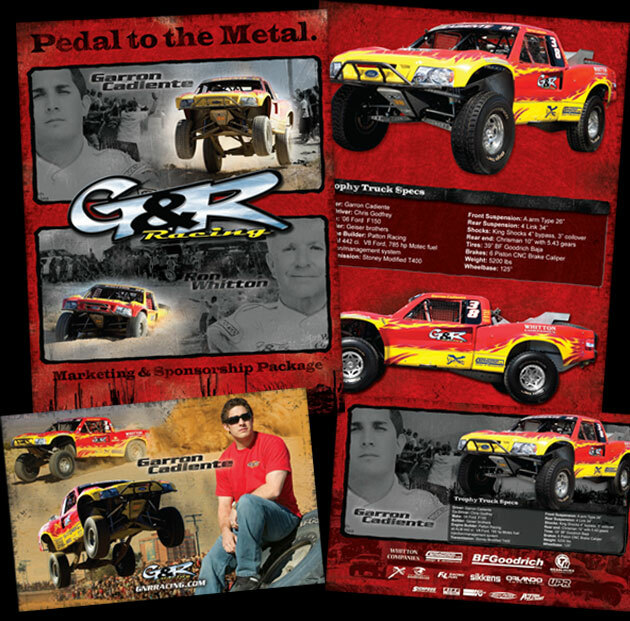 G&R Racing is one of the fastest growing off-road race teams in the entire country. Lead driver Garron Cadiente was named “Rookie of the Year” for 2006 in two separate race series – and they are poised to take their place among the top off-road racers in the world. G&R hired Mad Media to execute the creation of a media kit, website, signature card, and a custom line of t-shirts – all tied in together with the same design elements. We produced several professional photography shoots, and took their existing design concepts one step further. The new sixteen-page media kit is the perfect solution for communicating with potential sponsors. And the clothing, website, and signature cards have helped build a very large fan base of supporters both here in the US and in Mexico.